The unveiling of Campden's war memorial, designed by F L Griggs. Adrian Barlow’s illustrated talk was not confined to Britain but included references to Europe in general, the first of which was the massive Canadian memorial at Passchendaele, a constant reminder of the shocking loss of life one hundred years ago – 19,240 fell on the first day of the battle of the Somme in 1916. 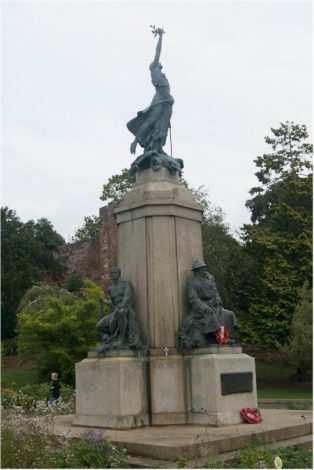 However, many memorials were of victory, such as that at Rougemont Gardens, Exeter, and not only of the fallen. Reference was made to prisoners, nurses and others. Pershore Abbey has a Winged Victory statue as its centrepiece. Famous architects were responsible for some memorial designs, such as that of Lutyens at Exeter Cathedral in 1921, which was created from a single piece of stone. A similar design (but of several stones) was used by Frederick Griggs in Chipping Campden. At Etaples near Boulogne is the Cross of Sacrifice which also remembered German and Chinese dead, and at Rancourt the three cemeteries of the English, French and Germans were all created within sight of one another. The memorial in Princes Street, Edinburgh, was a gift from the people of Canada. In Trumpington near Cambridge is Eric Gill’s “The Soldier’s Return” which was based on a drawing by David Jones, and, perhaps, more than many better known memorials, is so moving in expressing the futility of war. Mr. Barlow spoke of and showed us so much more, and the whole evening proved to be unexpectedly emotional. 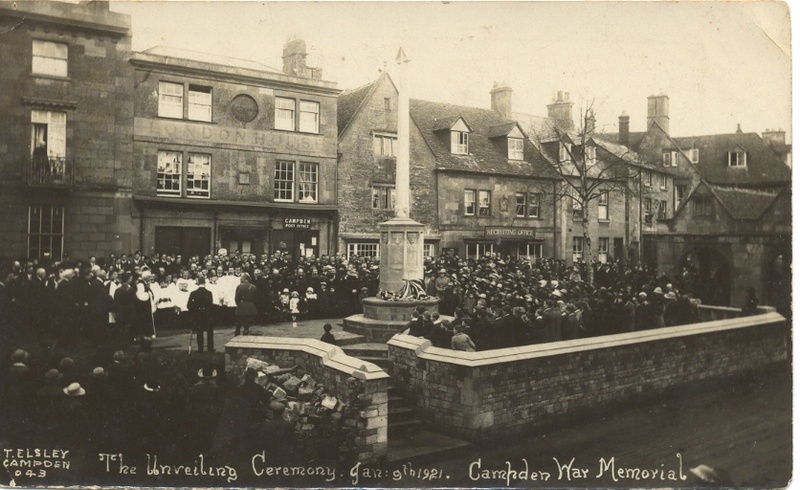 He concluded with a surprise reference to the east window of St. James’s Church, Chipping Campden, which, he suggested, was probably the finest war memorial window in Britain.